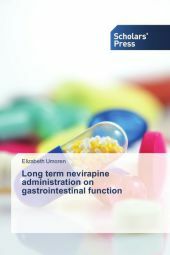 In view of the gastrointestinal side effects encountered on administration of nevirapine an anti-retroviral therapy, it was worthwhile to investigate the effect of nevirapine on gastrointestinal function especially as this is the first point of contact before it gets into the general circulation. Long-term nevirapine administration improved body weight, stimulated gastric acid secretion,pepsin and mucus secretion culminating in a higher incidence of ulcer induction; caused liver toxicity, poor fluid and glucose absorption and hyperbilirubinaemia. This book is intended for use by the general public and especially, for the health practitioners who are involved in the prognosis and diagnosis of treatment for HIV infected patients. Elizabeth B. Umoren holds a B.Sc (Hons) degree in Zoology, M.Sc. (Neurobehaviour) degree and a Ph.D (Gastro-intestinal tract Physiology) from the University of Calabar, Calabar, Nigeria. She is a member of the Physiological Society of Nigeria (PSN). She has published full articles in reputable Scientific journals.